Dynamic Displays has come a long way since 1962. I remember the days of typewriter tape and carbon paper—not necessarily with fondness, but certainly with some degree of nostalgia. Back then, the inflatable industry was just beginning to blossom, and Dynamic was not only riding on the cusp of progress, but was laying a lot of track too. Acknowledged as the inventor of the cold-air inflatable, Jim Thomson was the first man to put a fan to fabric, eliminating many of the problems associated with the original heavy rubber balloons produced by companies such as Goodyear. Always a man excited by the promise of potential, Jim began Dynamic Displays literally in his backyard. 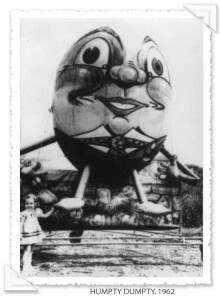 He and his team contributed hugely to the development and refinement of Inflatable Costumes, Floats and the popular Helium Giant. Where are we now? 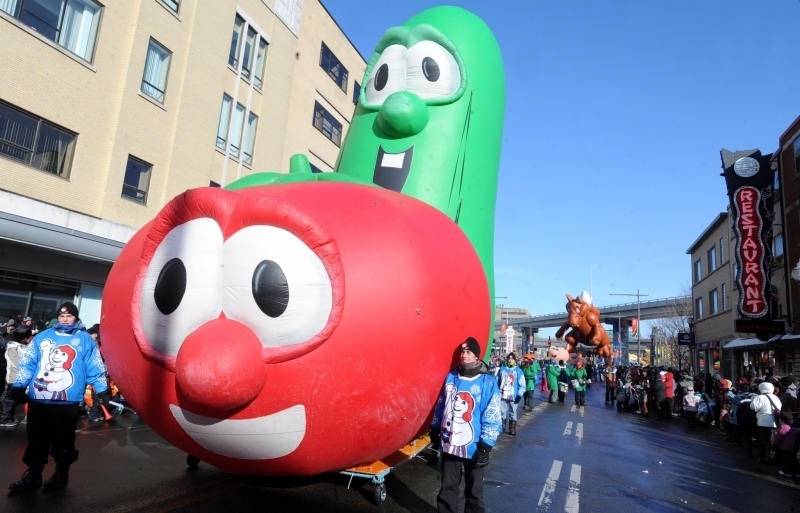 The industry has grown as large as its towering mascots, and parades are big business. We’re still dedicated to innovation, and still defining what quality looks like. So here’s to progress—America, we’ll see you on Thanksgiving. 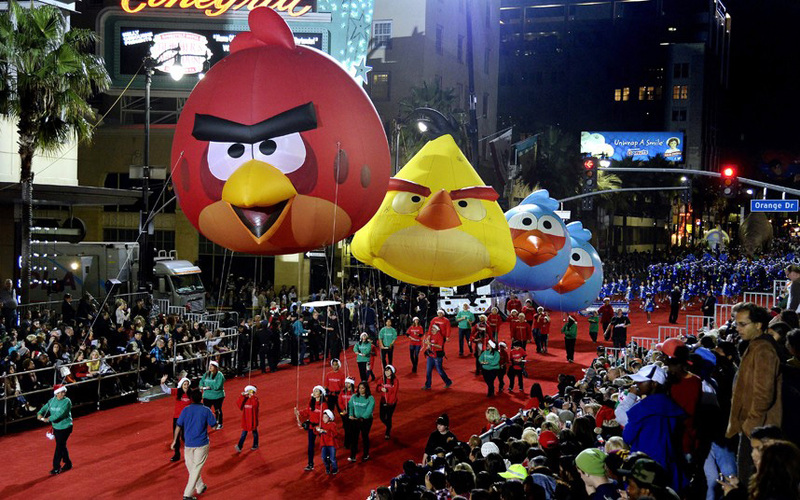 Introducing the newest addition to our parade and event balloons rental stock, a trio of Angry Birds! Featuring Red Bird, Yellow Bird and Bad Piggy, this helium balloon cluster is sure to be a crowd pleaser. Produced in cooperation and under license with Rovio Entertainment Ltd. 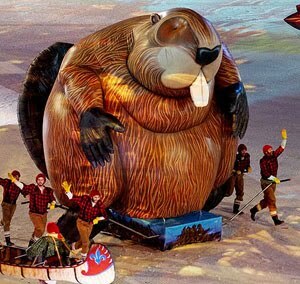 The Olympic Closing Ceremonies poked fun at a lot of stereotypically Canadian traits, featuring several inflatable beavers, among other home-cooked Canadian icons, like a couple of good-natured flying moose and a whole posse of mounties. A Canadian company, Dynamic Displays is proud to have been a part of the 2010 Vancouver Olympics games, even if we’re not taking home any medals ourselves. 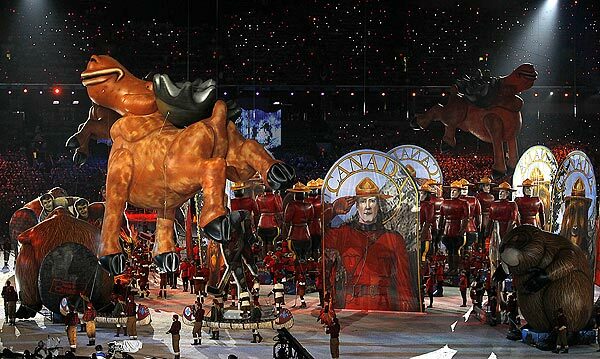 The “always enjoyable inflatable beavers,” along with their giant companions–a squadron of mounted police, inflatable moose, and giant hockey players (sporting gold medals in honor of Team Canada’s recent win in Men’s Hockey) are brought to you by Canadian hands. As Canadians, we’re all immensely proud of our athletes and couldn’t be more happy to have contributed to the Olympic Closing Ceremonies. Take a look at the pictures after the jump! In 2010, the two-year-old fledgling parade (launched as part of the Carnival in 2008) incorporated a huge line-up of giant helium balloons from Fabulous Inflatables. A team of 25 Dynamic staff members made the trip to Quebec’s capital city to guide the giants through her historic streets. 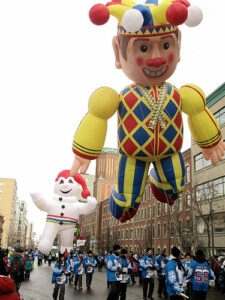 Leading the way was Bonhomme Carnival, the festival’s official effigy since the 1955 event. 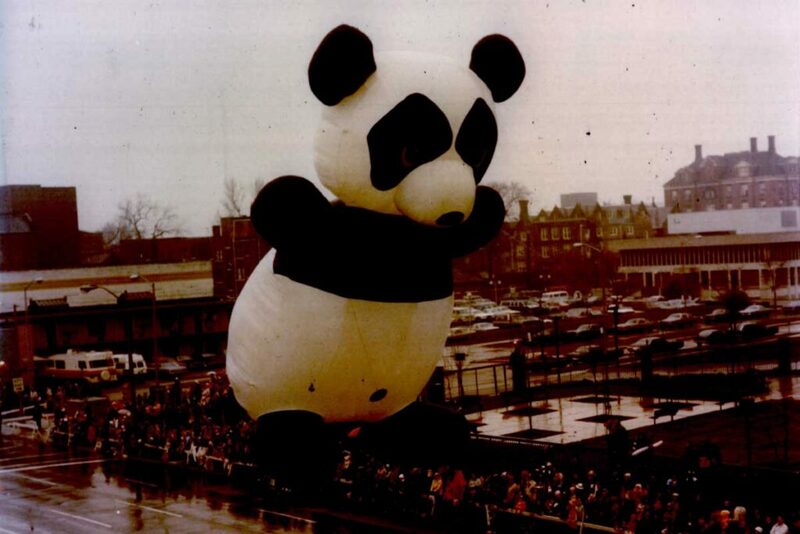 He has been immortalized as a giant, 40-ft custom helium balloon. Everyone’s favorite underdog took a break from his usual gig in your Sunday paper to appear in the Pro Football Hall of Fame Enshrinement Festival Timken Grand Parade. The giant Ziggy balloon was built by Dynamic Displays and completed his maiden flight in the 2009 event, garnering enthusiastic reviews. 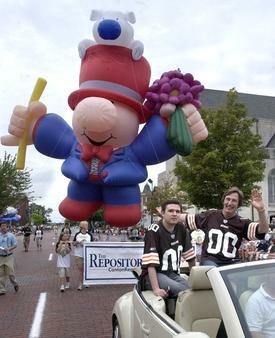 Ziggy’s creator, Tom Wilson (pictured waving at the crowd), also appeared in the parade alongside the balloon. 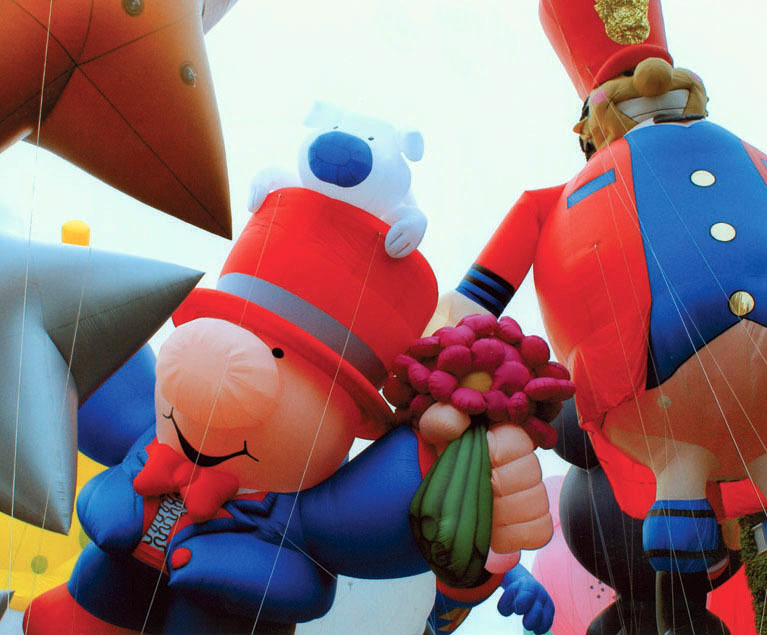 Dynamic Displays is proud to welcome Ziggy into our stock of rental parade balloons. 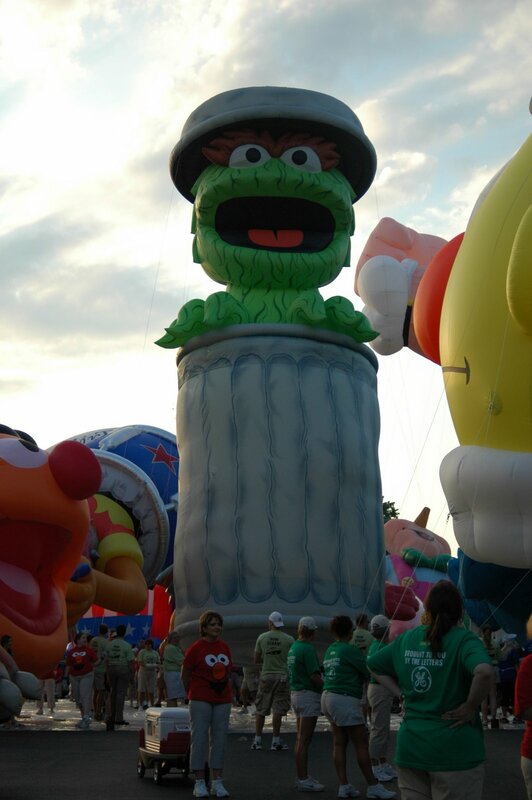 Our other licensed character balloons include crowd favorites like Elmo, Kermit the Frog and SpongeBob SquarePants. Check out Dennis the Menace in the Pro Football Community Parade! 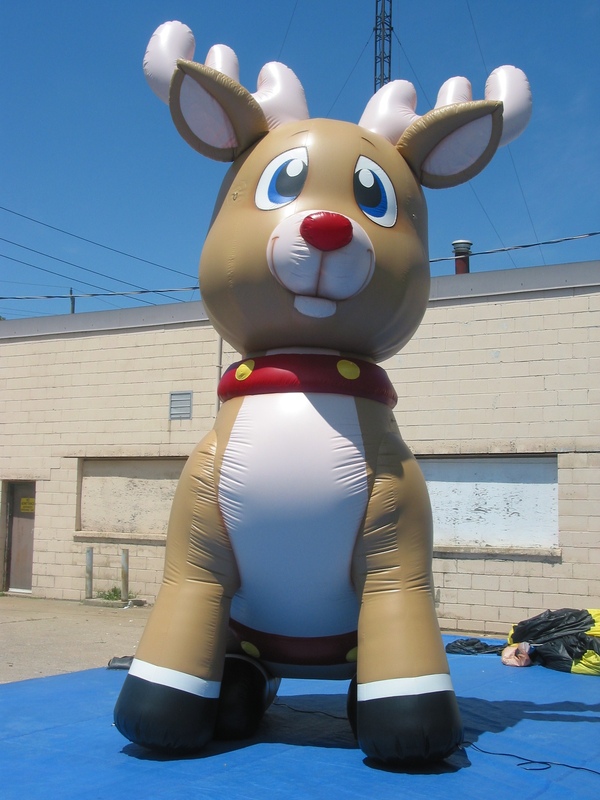 Dynamic Displays recently completed production on a giant reindeer inflatable for the Lion’s Club Kitchener. Design courtesy of our in-house artist–cute, huh? How soon is too soon to be thinking about Christmas? Personally, I love the holiday season—not only is it a busy time for us here at Dynamic Displays, but I have a lot of leftover giddy anticipation from my childhood. Why mention it in July? As every business person knows, real seasons begin about six months before the general public starts to take notice. If you’re an event planner, you’ve probably already started to make plans for the holiday season. If you haven’t, you should! Starting early will help you avoid some of the stress and pressure that comes with the winter months. Check out Dynamic’s catalog of holiday balloons for a little inspiration. 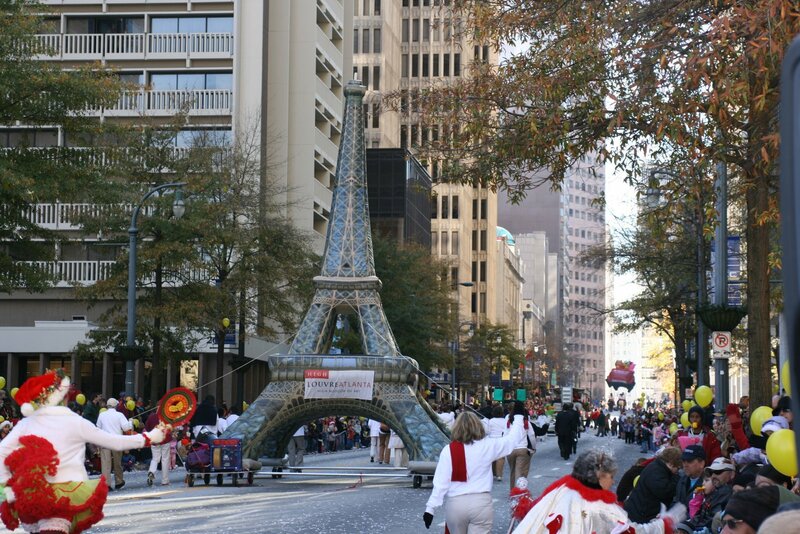 Helium and cold-air inflatable characters make cheerful additions to your holiday parade or event. Paris’ Eiffel Tower stands at an intimidating 1,063 feet, constructed by three hundred workers for the World’s Fair in 1889. Today, the structure is one of most recognizable pieces of architecture in the world and is being considered for recognition as one of the new 7 Wonders of the World. 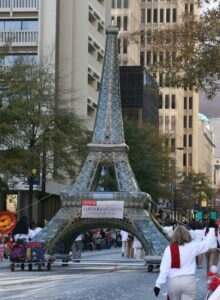 In 2007, Dynamic Displays’ team of thirteen built the Eiffel Tower again—this time from fabric and ink. Dynamic’s artistic team painstakingly reconstructed the tower to be as true to the original as possible, piecing together photographic images to recreate the structure’s unique pattern of latticework. The finished product, at 40 feet tall, is a testament to the flexibility and artistic capabilities of the inflatable medium. 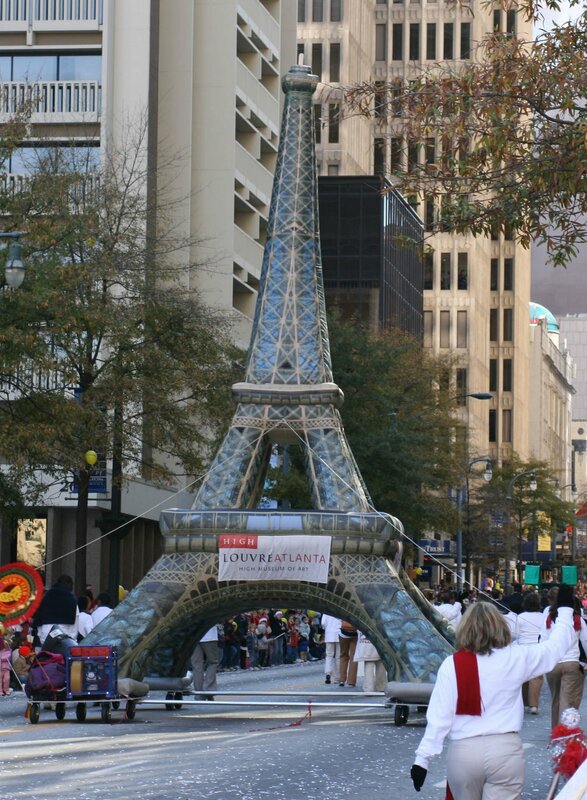 The completed inflatable Eiffel Tower was built for the Louvre Atlanta High Art Museum and was exhibited in the 2007 Children’s Heathcare of Atlanta Holiday Parade. Giant inflatables can create an especially big impression at trade shows and conventions, as BlackBerry recently proved. Dynamic Displays created several huge replicas of a couple of their recent handheld product models for indoor and outdoor display. 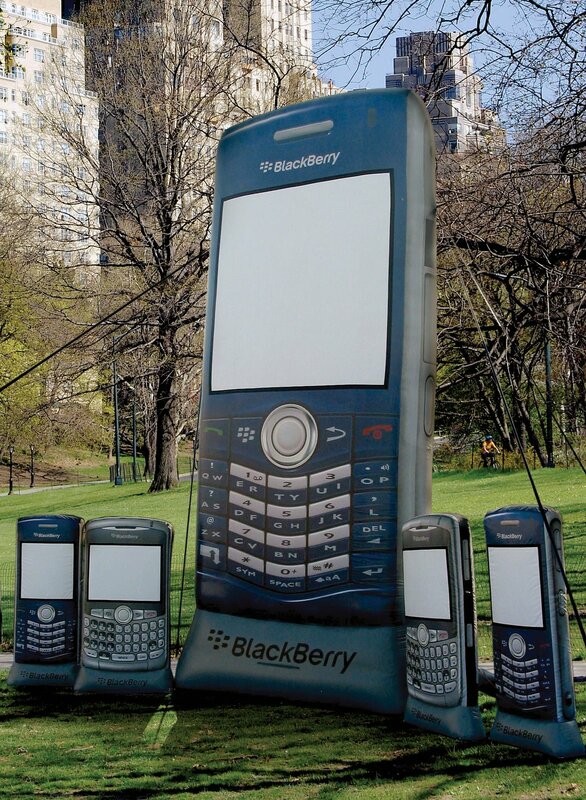 Giant product replicas have been proven to reinforce brand recognition in the minds of passing consumers—besides that, they’re just fun to look at. Detroit Red Wings "Al the Octopus"
About a month ago, Dynamic Displays rushed a huge purple octopus through the production line. 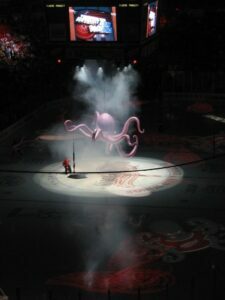 Within a couple weeks, the Red Wings’ mascot took on a new shape—an inflatable one. Al the Inflatable Octopus demonstrates one of the many creative uses for inflatable products. 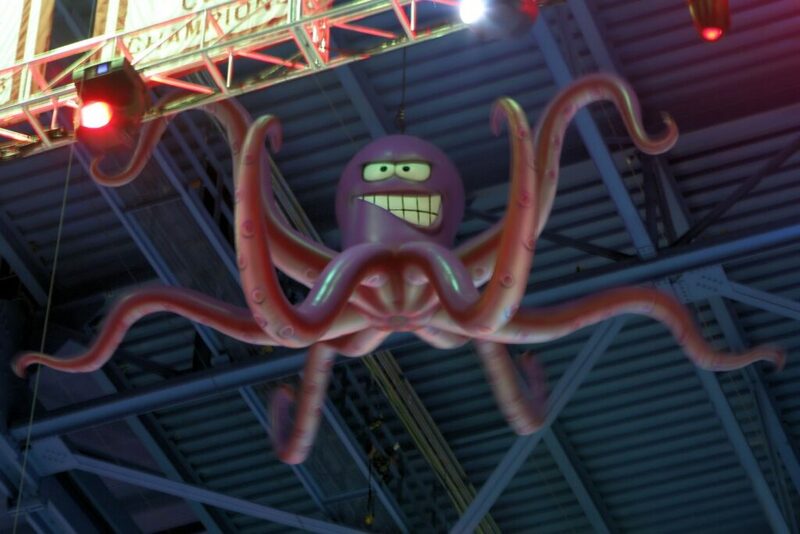 At the game, the inflatable octopus sank from the score boards and slowing raised his tentacles to the crowd before descending to the ice, grinning all the while. I guess he was glad to be there. And why not? His team won. Got a mascot? There are a lot of fun ways that you can increase their visibility. April 14, 2008 / Comments Off on Harris Bank Takes to the Skies: Corporate Mascot Roars to Life! Harris Bank Takes to the Skies: Corporate Mascot Roars to Life! Brand reinforcement is an important part of advertising in today’s over-saturated marketing arena. 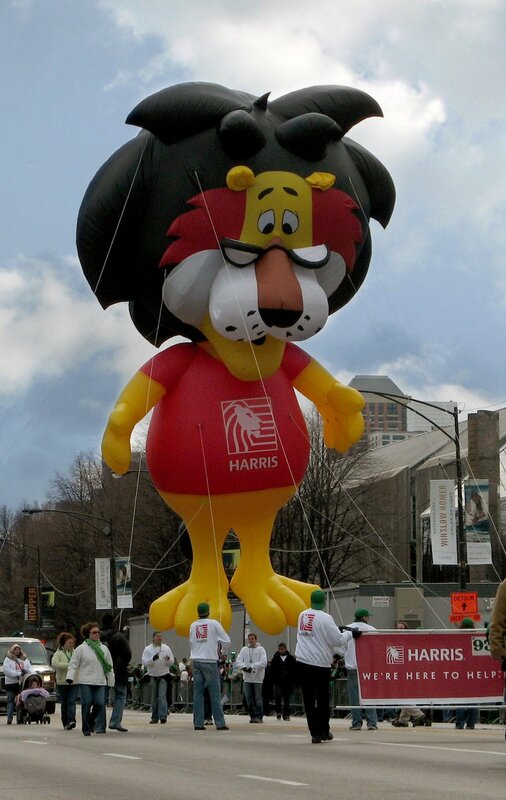 Harris Bank took some big steps to promote their brand with a 30-foot replica of their company mascot—Hubert the Lion. 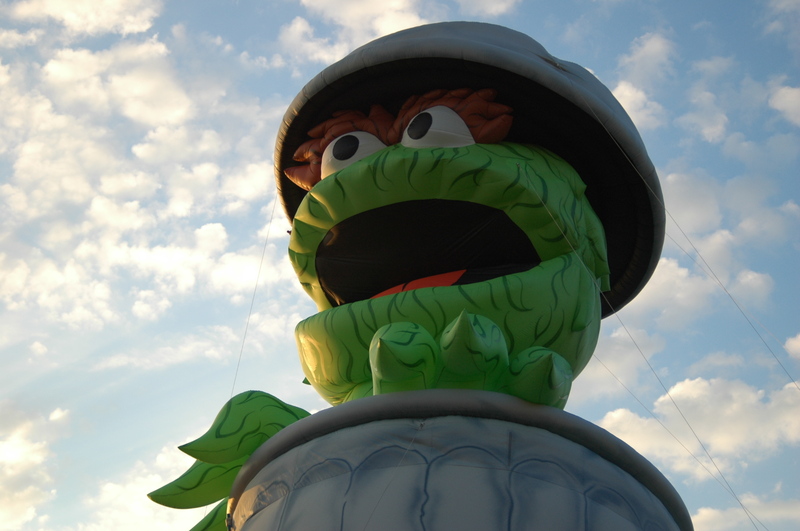 Hubert made his debut as a giant helium balloon on March 15, 2008 at the Chicago St. Patrick’s Day Parade, where he performed proudly for thousands of Chicago residents and visitors. The Chicago St. Patrick’s Day Parade is also broadcast live on national television. Inflatable mascots are a great way to increase brand awareness. In addition to the giant helium variety, Dynamic Displays also produces custom cold-air rooftops and inflatable costumes. Parades are such exciting events. 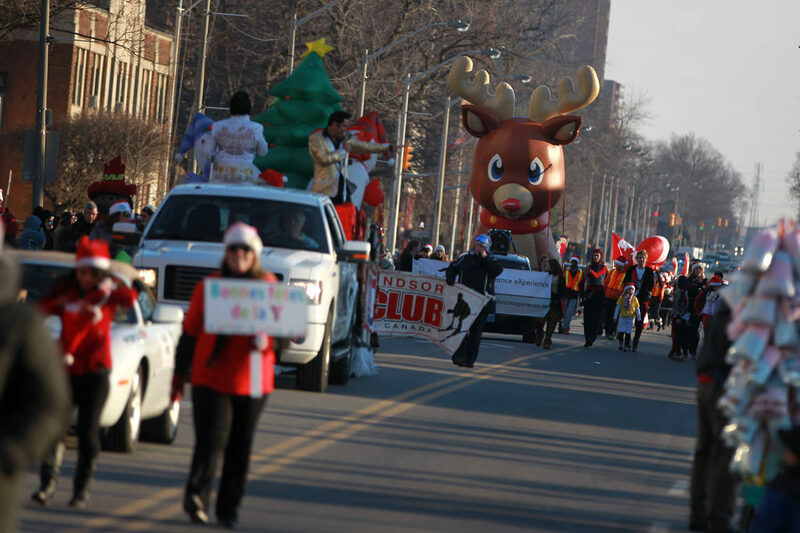 Throngs of people suddenly turn up on the downtown city streets, toting lawn chairs and small children, all anticipating the same thing–the magic and excitement of the parade experience. You can feel the anticipation in the morning air as step-off approaches… the floats are lining up, the bands tuning up, and somewhere around the block, the balloons are being let loose to rise slowly in preparation for flight. I think the thing I like most about parades (aside from the giant balloons, of course), is the way all parade participants give themselves over to the fun with such wild abandon. Where else would you see grown men proudly sporting a multi-colored wig and a full face of paint? They’re having such a grand old time, too. Events like America’s parades give everyone the chance to be a kid again, to gasp in awe at the giant helium balloons soaring through the streets and to shout with amazement at that particularly amazing float. And that’s just the crowd–parade participants get to play dress up, ham it up for their watching friends and family, and march with pride through the streets of the city they love. We all need a chance to let loose once in a while, and I’d say that parade day is a great chance to do just that. 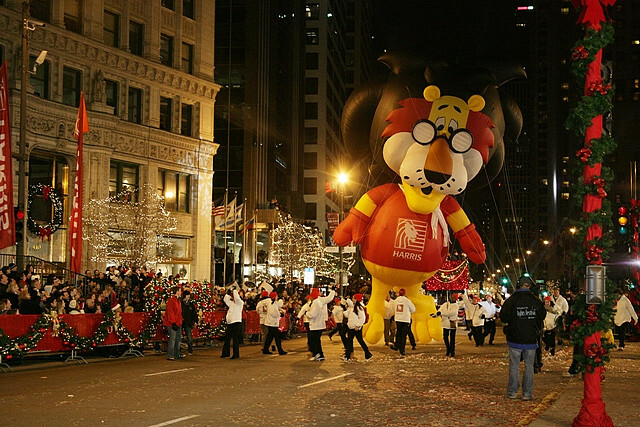 Coming to your hometown this Thanksgiving, Dynamic Displays’ cast of giant parade balloons will help usher in the holiday season. Watch for us.